Hi everyone! I think I have finished most of the work to get moved from Blogger to WordPress. There are a lot of aesthetic things I still want to fix, and I'm working through the list of broken links, but most of everything is here. If you have any difficulties, especially with your RSS feed, please send me an email (see button on sidebar) to let me know! Now back to our regular programming... some sewing for QuiltCon! I decided that I need a cute new bag to carry my supplies around while I go to classes. And it would have to be big so that it will fit not only my supplies, but also a hand-sewing project if I have any downtime. 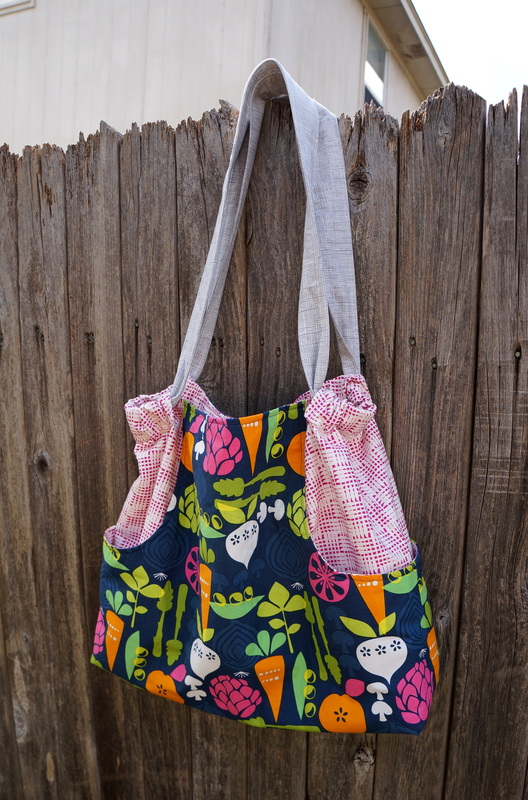 So I rummaged through my stash, and looked around at patterns and tutorials, and ended up going with the Multi-Tasker Tote! I've actually had this Anna Maria Horner pattern for a while now, but I never got around to making one. It's super roomy with lots of pockets, and it's plenty big for holding everything I'll be carrying around. I've been hoarding this vegetable fabric (from the line Kitchy Kitchen) for a while now. I was originally going to make something for the kitchen with it, but I think this is a much better use. 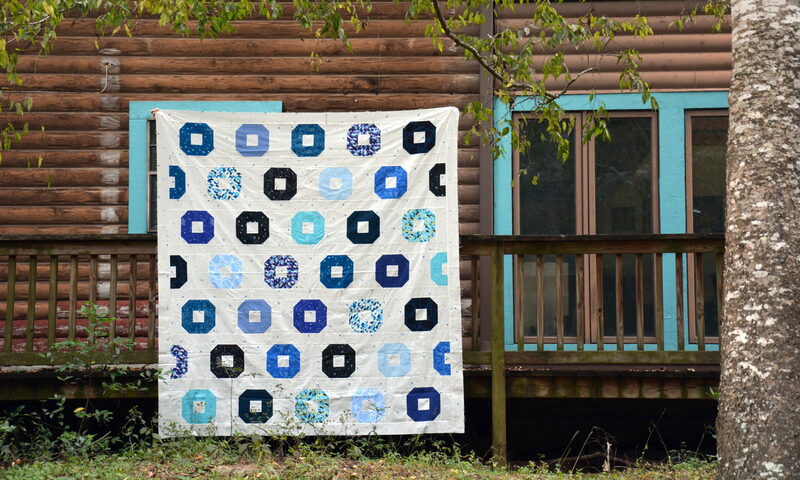 I'm SO excited to use this at QuiltCon! I'd really like to have a new wallet to match my bag. 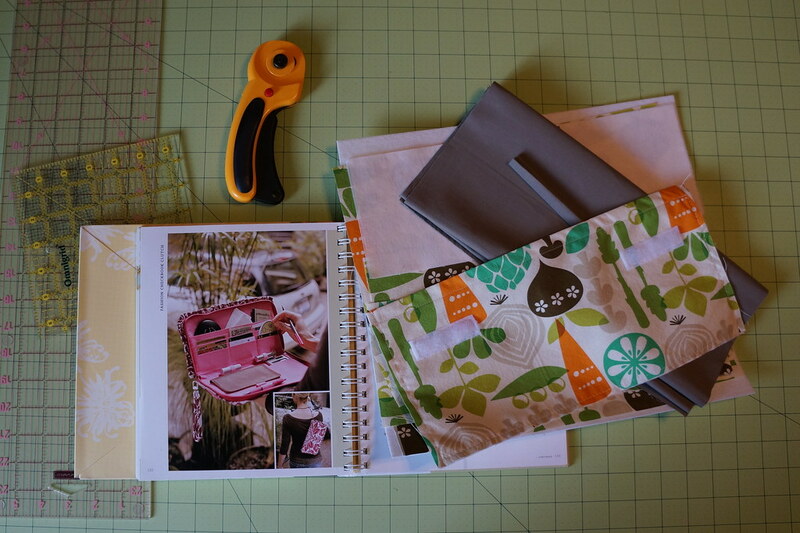 It took me for-e-ver to find a pattern that I really liked, but I ended up picking the Fashion Checkbook Clutch from Amy Butler's In Stitches. I know, her patterns are notoriously impossible, but I really liked the idea of having room for my checkbook and pens and whatnot all in my wallet. Well, let me tell you. I've hit a roadblock on this one. I got the outside assembled nicely, but the perimeter of one half is not the same as the other half, which means I can't insert the zipper as is. I think I can probably fanagle it to get it to work, but it's going to be a headache, so for now it's getting benched. I've picked out a new pattern to try, so hopefully this new one will go more smoothly. I'm also planning (read: pretending I'll have the time to) make some other accessories for my bag: a manicure kit holder (because I keep getting stabbed by my nail clippers that like to roam my purse), a pencil case (for sewing supplies), a camera strap (cause they're cute), a kleenex pouch (allergies anyone? ), and maybe a purse as well (since this tote is way too huge to double as a purse). And QuiltCon is in two and a half weeks... I can do it, right? Haha!